The problem is that the phrase, a longtime favorite of prosecutors, has a divisive and troubled history. Kamala Harris launched her presidential campaign on January 27 with a speech that unveiled her new campaign slogan: “For the People.” Harris made use of this tagline early and often, wielding it as a clever link between the present and the past—between her current aspiration to represent the people of the United States as president and her long public career, about which, she said, “My whole life, I’ve only had one client: the people.” This claim to represent “the people” is not unusual for a career prosecutor—Harris was both a local district attorney and California’s state attorney general, and California is one of several states that officially designates the prosecution as “the People” in criminal court. But it is a deeply misguided claim—one that misunderstands the role of a prosecutor and risks undermining any larger goal of fighting mass incarceration or reforming the criminal-legal system. When a prosecutor stands up in court and calls herself “the People” in the same sentence that she requests that an individual person be given a criminal record, or separated from their family and loved ones by jail or prison, that naming of “the People” cements in our minds the problematic idea that individuals who are prosecuted are not part of the people who matter when it comes to politics. Nor are their loved ones and supporters. As I’ve written elsewhere, the prosecutor’s claim of speaking “for the People” reinforces the ways in which we exclude entire neighborhoods from political participation via the practices of mass prosecution and mass incarceration: More than 6 million people with criminal records cannot vote, and they and their families and neighbors interact with the police, courts, and jails every day in ways that signal to them that they are second-class citizens. As social scientists have shown, the mass policing, supervision, and incarceration of communities of color results directly in the diminished political power of entire neighborhoods. We should abandon the idea that prosecutors act “for the People,” eliminating it from formal case captions and colloquial speech alike. Instead, it is more honest to designate prosecutors as “the State,” “the Commonwealth,” or “the Government”: they are state actors, wielding their state power to prosecute individual defendants. We might view them as a necessary part of the role of the state, but when they act, they do so against part of the people as much as for them. At a CNN town-hall event last week, Harris defended her record as a prosecutor, listing off a series of reforms that she supported and describing her pursuit of criminal cases involving “the most vulnerable” victims. But many people who are prosecuted are vulnerable, too. And, surely, we can all agree that they are people. 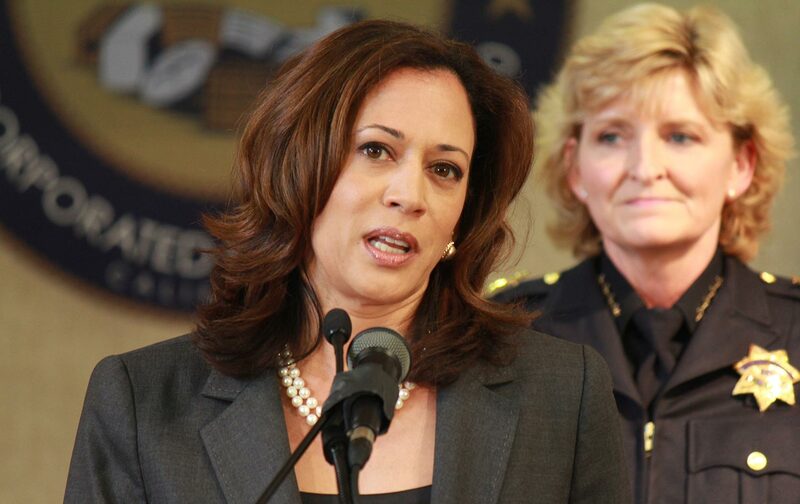 Harris, and all of the candidates, should aim to expand their visions of who is worthy of representation: As presidential hopefuls, they should aspire to represent us all. Jocelyn SimonsonJocelyn Simonson is an Associate Professor of Law at Brooklyn Law School. She writes and teaches about criminal law, criminal procedure, and the ways that social movements shift our views of justice. She is @j_simonson on Twitter.